This. Was. Awesome. I am so happy to finally go back to the world of Tessa, Meredith, Cortessa and their mates. After everything Meredith has been through I was so hoping for her to have the happy end she deserved. 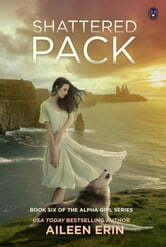 But the problems just started and she has to face not only the pack of her true mate, Donovan, but also find a way to convince the were world that there is a mad wolf among them. Add to this the threat of a vicious fay beast dead sett on getting rid of her and the happy ending is nowhere near. Drawn into the story from the start, it was impossible to put the book down. Action filled and full of suspense it is an intense ride. I love the world-building and it is great to find out more about Meredith and Donovans’s background. I hope that they can restore peace and help the Irish pack to be a family again. Can’t wait to read the next book, but unfortunately it’s a long wait. I think I will re-read the books to shorten the time. I chose to read this book and all opinions in this review are my own and completely unbiased. Thank you, NetGalley and Ink Monster LLC!